Christmas Goodies and Weight-watching – Are They Oxymorons? 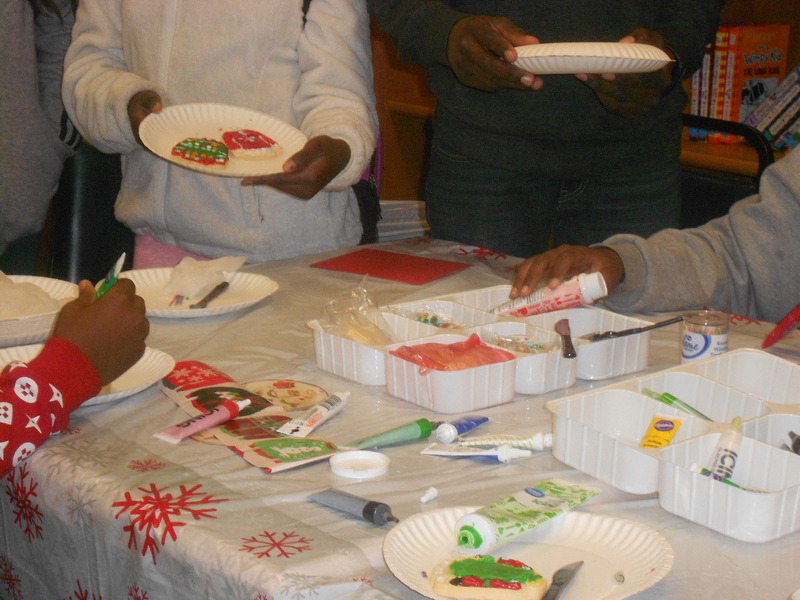 At the Village Library where I tutor once a week, I watched the kids decorate Christmas cookies. 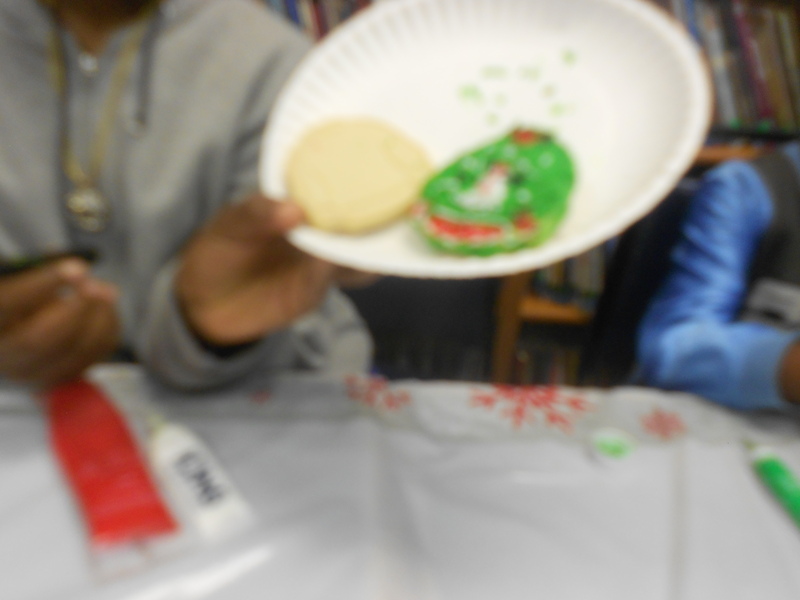 They had a lot of fun designing Christmas sweater cookies. Then I went home and baked some of my own to give to neighbors. I tasted one or two—to be sure they were good—but the last tray got burned. After packing up cookies for five different neighbor houses, there were none left to eat that were not burned on the bottom. Maybe that was a good thing—for my waistline. My husband and I took a pumpkin pie to my daughter’s house on Christmas Eve. We planned to celebrate my oldest grandson’s birthday—he was born on Christmas Day, so we try to have a separate time for him—but he got the dates mixed up and didn’t show. My two daughters and a friend had baked six or seven different kinds of cookies, including Baklava, so rich it was cut in one-inch pieces. Of course, I had to try several, but I was careful not to bring any home. Except when my daughters and both grandsons this time, showed up for Christmas dinner, one daughter brought a small plastic container of cookies. It took my husband and I only two days to finish them off. I got on the scale the day after Christmas and found I’d added three pounds. Returning to my regular routine, 30 minutes on an exercise bike and a six-block walk was definitely needed. My New Year’s resolution is to rejoin the gym and go once a week. With all the leftovers in the refrigerator (Oriental Green Bean Dish, Corn Pudding, Sweet Potato Dish with Pecan Topping, and Macaroni and Cheese), I only add servings of two dishes and one roll to the turkey slices I warm in a Ziploc bag and serve with a little gravy. I alternate pumpkin or pecan pie for dessert with berries, so I don’t add so much rich foods, and so far, that’s worked to keep the weight from rising—but now one pound will get me back to normal and ten will get me to my desired weight. I’ll never weigh as little as Miss America, but that’s okay. Now here’s a recipe for Turkey Tetrazzini from my cookbook, There IS Life After Lettuce, (now out of print, but I’m working on a new one.) Chicken Tetrazzini was originally developed for the opera star, Luisa Tetrazzini, around 1908-1910, probably by Ernest Arbogast, the chef at the Palace Hotel in San Francisco, where the popular soprano stayed a long time. I like to make it with fresh mushrooms that have been fried in Imperial Margarine. Sometimes I make it with ham and chicken instead of turkey. Mix and bake uncovered at 400 degrees for 15 minutes or until heated through. For microwave oven, cook on high 6-8 minutes uncovered. This makes 6 servings. Nutrients per serving (using turkey or chicken, 4 slices cheese and no margarine) 222 calories, 7 g. fat, 57 mg. Cholesterol, 15 g. carbohydrate, and 332 mg. sodium. Nutrients per serving (using turkey or chicken, 4 slices cheese and no margarine) 222 calories, 7g. fat, 57mg. Cholesterol, 15 g. carbohydrate, and 332 mg. sodium. This entry was posted in Delicious dishes and tagged Goodies and Weight Watching, Turkey Tetrazzini, Using leftover turkey. Bookmark the permalink.